Midnite’s pre-wired inverter systems offer a turn-key solution for installing battery-based inverter systems, saving time in the field. A pre-wired solution eliminates confusion surrounding selecting the right parts. Hookup between inverters is done with included wire and conduit. This system uses 2 of the SMA Sunny Island inverters rated at 6,000 watts each and uses a 48 volt battery bank. This pre-wired system is specifically designed for AC coupling grid-tied inverters, to retrofit Sunny Boy and other grid-tied inverters with battery backup. 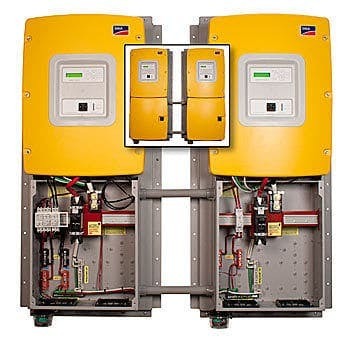 This system can be coupled to grid-tied inverters up to 12kW in size. For more than 12kW of grid-tied solar, see the MNSI6048D-ACCPL-SMARB which can handle up to 19kW of grid-tied PV power.